Coop and I were doing our semi-weekly store checks the other day when we spotted something weird: foam family board games. Apparently it's not enough to have checkers, chess, four across (what I know as Connect Four), Tic-Tac-Toe and Chinese checkers. Now there are versions of each of those made entirely of foam. They are from Pavilion -a member of the Toy'R'Us family of companies. I suppose the foam version could be good if sister gets mad and wants to pummel brother with the board and game pieces, but I doubt that was their thinking in making these! Really I'd be more impressed with the foam version of chess they had three dimensional foam pieces instead of paint on the checkers. So Urban Taggers, arguably the premiere blog and source of NERF information on the interwebs, brought up an interesting discussion. "What really MAKES it for you?" There are several sub-groups of fans for as many different types of toy blasters and melee weapons and manufacturers there are. 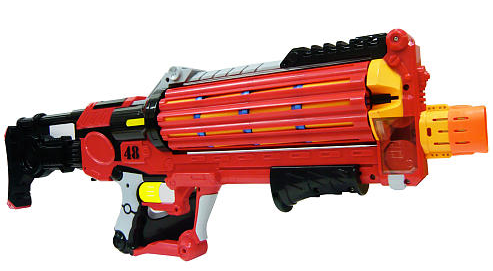 Though one very common push among current blaster and toy gun fans is that they should all fire darts. Personally, I think there is room for more than just dart launchers is our lives. With the announcement and demos of the new NERF Vortex blaster line, there has been a lot of discussion both for and against disk launchers. Disks, darts, water or . . . balls, this blog will be happy to cover the whole range of them. We definitely need it to shoot SOMETHING, but we're not bent on one form of ammo. Generally we're fans of the foam. Foam is a great substance, especially for it's safety aspects. You'll hear a lot of pubescent and otherwise self-involved Airsoft fans insist that to "grow up" is to play Airsoft. But foam takes the cake for a lot of reasons in this book; A) You can fire most, if not all foam blasters in the house without breaking stuff. B) You can fire most of the foam blasters at kids without really causing pain. C) You can carry most stock foam blasters in public without inciting a panic in anyone (besides intended victims). D) It's way easier to find and re-use your foam ammo. So in all, I'd say there can be a large variety of answers to what really "makes it" for me. Give me a blaster with some good ammo that I can pop off at anyone, then you can probably get a smile out of me. Two of my personal faves: NERF Maverick and Air Zone Power Strike 48! Shortly after we founded Click Click BAMF, Coop discovered a growing alternative sport brought forth by the Foam Weapon League. They take a pick-up joust with foam swords and other weapons to the next level. Real Fighting, Fake Blood. What's not to like? 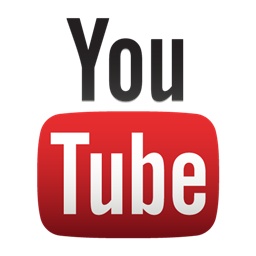 It was perfect for a company like ours to follow and we've had a lot of fun keeping up with what they've been doing. 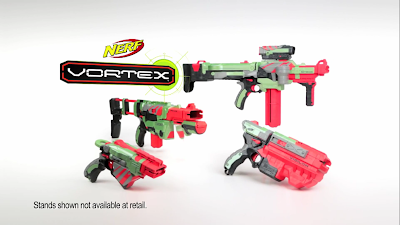 In their third Vortex video release, NERF has finally confirmed and officially released what the blasters are going to be called as part of the Vortex line. Getting an even better look at the blasters, I am personally twice as excited to try each of them out! The size of the blasters in the shot I picked above is obviously not proportional if you compare to the other two videos they've released. We all were comparing the stock that comes with the Praxis to the Recon stock, but the new version looks loads more comfortable and sturdy. I, for one, am crossing my fingers that they release it in the N-Strike color scheme as well (not just the Gear Up version). BTW . . . Vigilon? Weird name. Maybe it'll grow on me, but I think it's kind of weak. NERF Swarmfire on the Beach!